Our southern wanderings landed us in New Orleans yesterday for the very first time, a day trip from our current campsite at Dauphin Island, Alabama. The first thing that anyone needs to know about visiting the Big Easy is that one day is nowhere near enough to take it all in. Kaye and I knew this going in and decided to dedicate our limited time to the French Quarter. 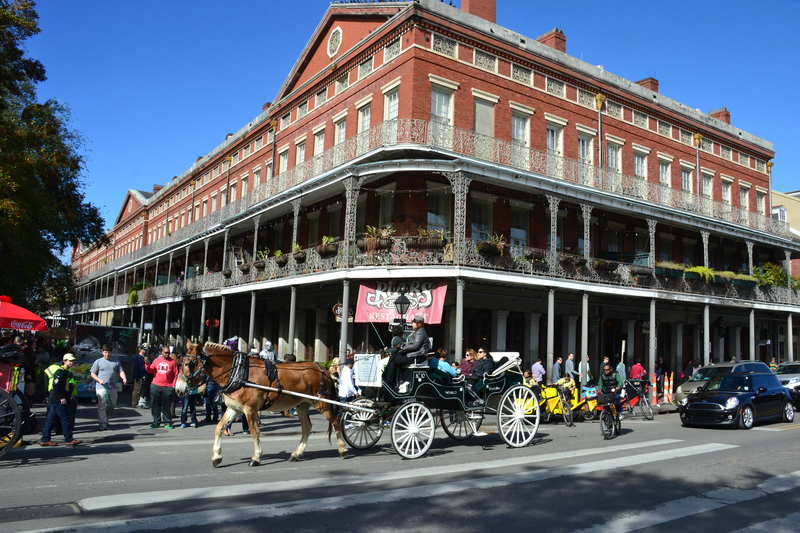 The French Quarter is known for its porch-lined buildings that reflect the traditions of the old country. The streets are rather narrow and lined with old two and three-story brick buildings with beautiful balconies that add a distinctive charm suggestive of Paris. Of course. Our tour was self-guided and on foot, so we avoided the buses and carriages and asked for directions whenever we wanted to; there were always very talkative locals willing to help. They were oozing with city pride, walking encyclopedias of local trivia. Carriages and rickshaws are available and the streets are shared by cars, buses, bikes and pedestrians all at the same time. We hadn’t wandered very far before we came upon the first of many street bands blaring Dixieland jazz with lots of horns. It seemed there was a band on every street corner… and in many of the restaurants as well so the visitors’ meals are always serenaded. Our lunch and dinner were both seasoned with music at outdoor cafes, first at the Market Cafe, then the Beignet Cafe at Music Legends Park. 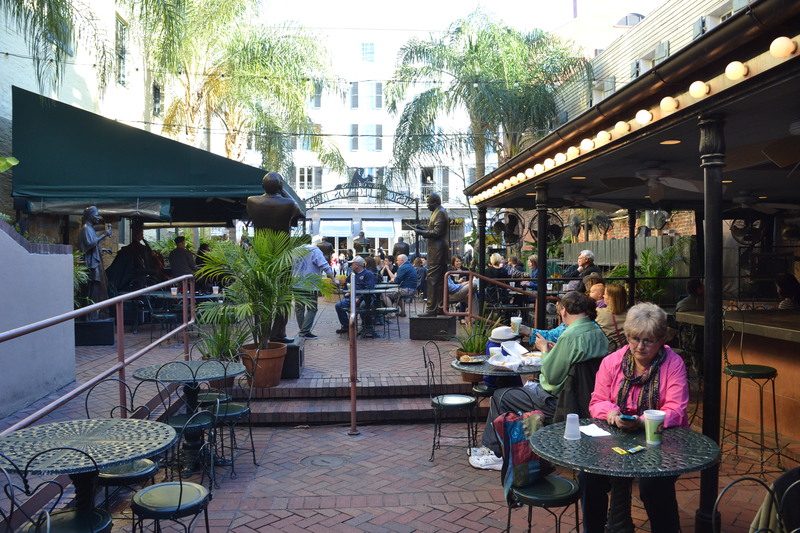 We were surrounded by brass statues of music legends at Beignet Cafe. 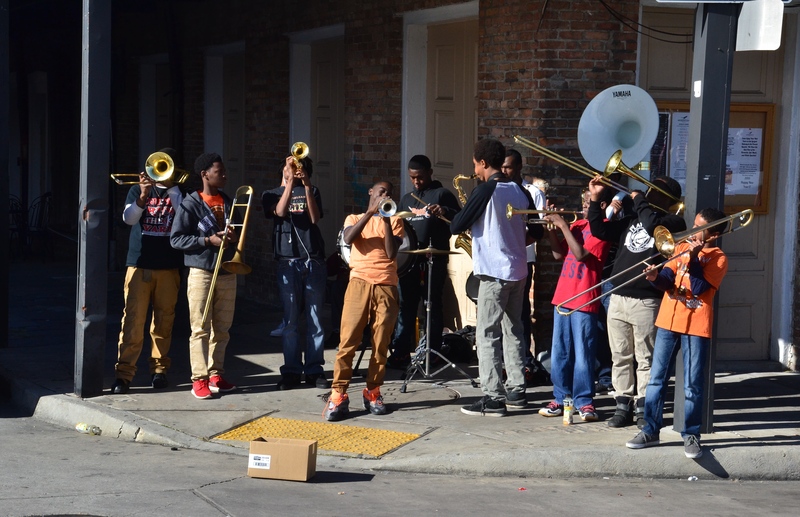 An 11-piece youth jazz band was performing on the street corner across from the Market Cafe. 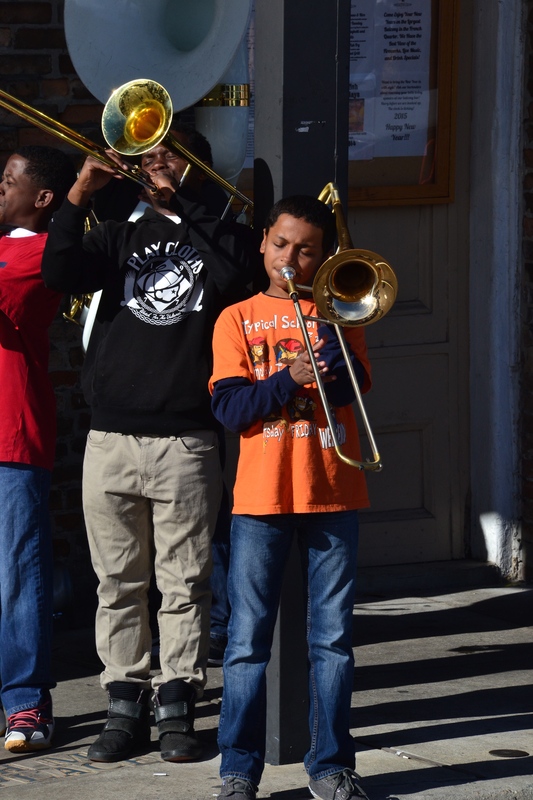 This 12-year-old was a spirited trombonist who put a bit of southern soul into every note. 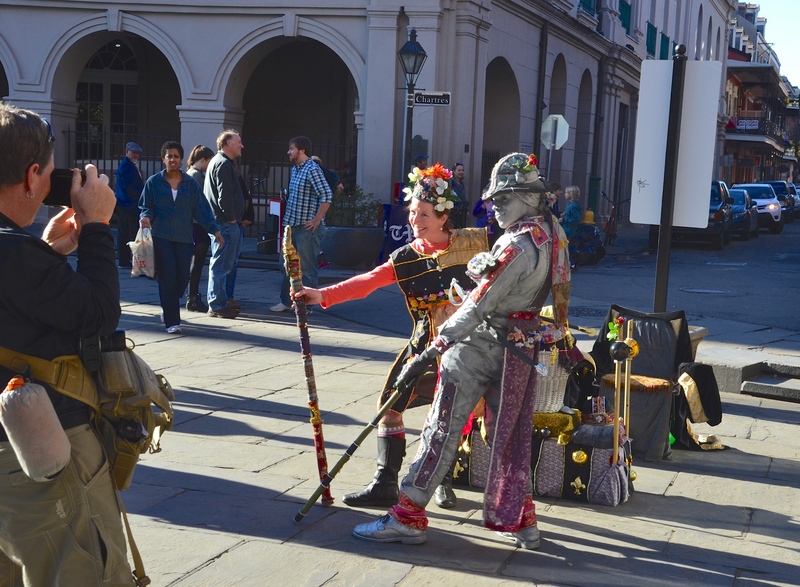 The French Quarter is a wonderland of street performers, and they are not all musicians. Some were troubadours, artists and statues… who came alive at choice moments and startled passersby. 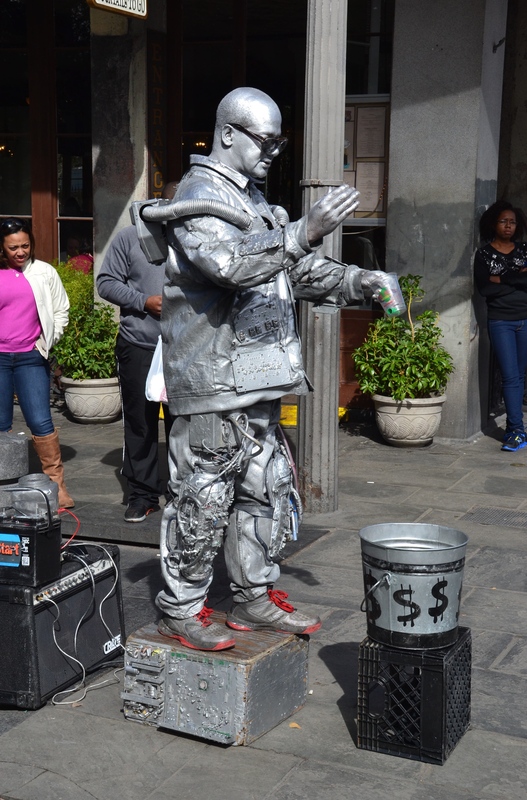 This silver Steampunk statue came alive with whirring sounds when he moved. 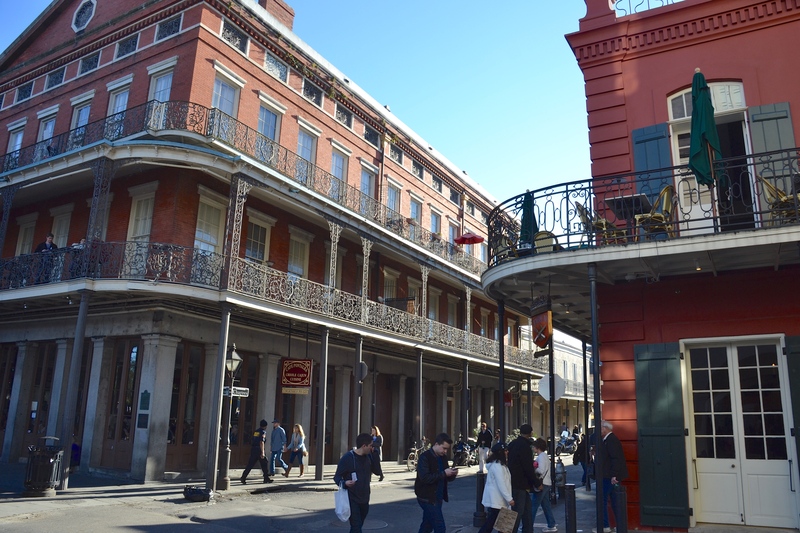 There is a plethora of shops down both sides of every street between the cafes and pubs, so the signature pralines and poboys and beignets were readily available… and a whole lot more! 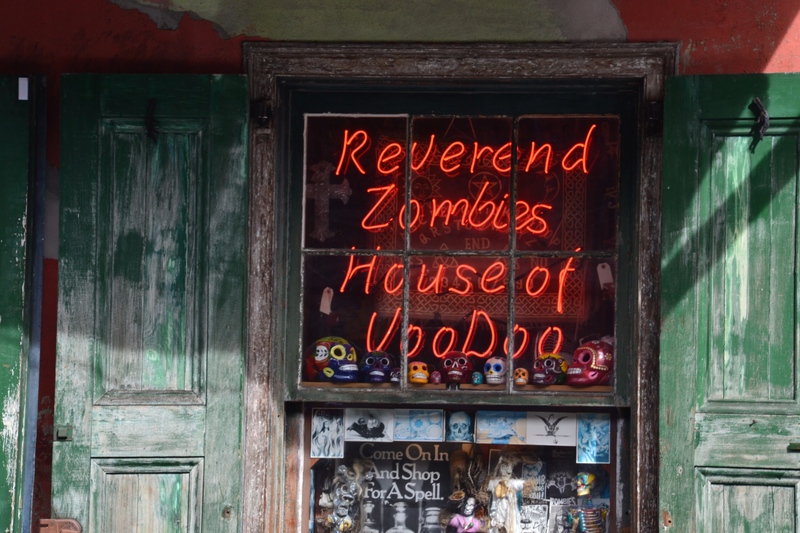 Spiritists and palm readers abound in the French Quarter. 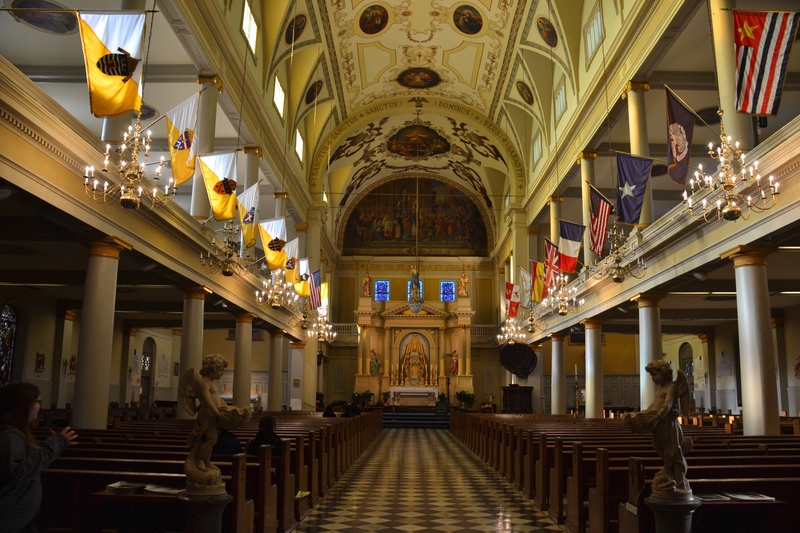 A part of the architectural extravaganza here — and not to be missed — is the famous Saint Louis Cathedral in the middle of the French Quarter. It is beautiful both inside and out. 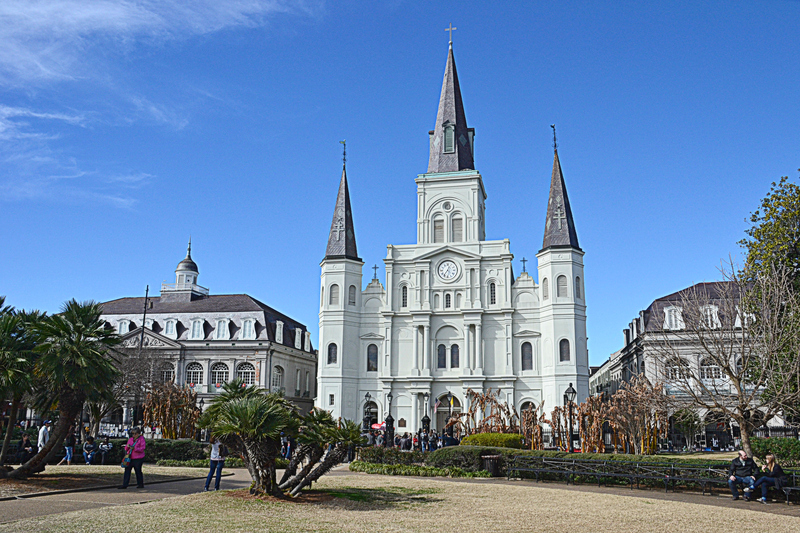 The fairytale-looking Saint Louis Cathedral towers over Jackson Square. It’s taller than wide. 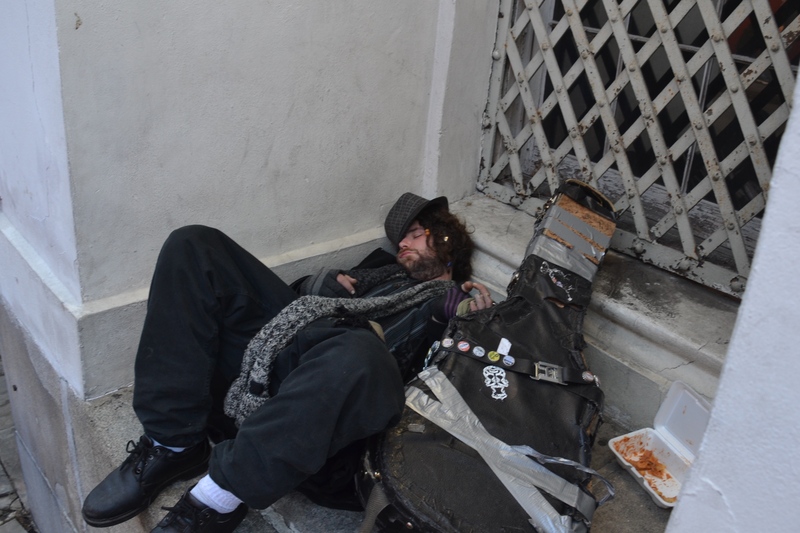 Anyway, I would not recommend the French Quarter of New Orleans for a quiet getaway. It’s a loud and raucous place full of brass bands, rich cuisine and southern soul. And that’s in the daytime. After dark, add neon lights and a bit of decadence. Street performing is hard work and this guy was done for the day. We could relate; walking tours are exhausting too! And check one more amazing place off the bucket list!